Love from the Kitchen: Delicious Cookies! I baked these cookies for my in-laws to take to The Mr's brother for Thanksgiving. I thought they sounded a little bit Thanksgiving-y and they ended up tasting fantastic! Shortbread cookies, with some cornmeal to give it an interesting texture and slightly sweet taste. And the jalapeno jelly gave a little bit of heat. 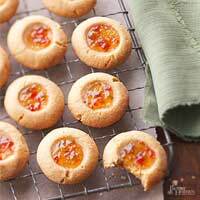 If you like a bit more spice, make larger cookies than the recipes calls for and use more of the jalapeno jelly. These look outrageous. Can't wait to try them.